It’s known that early man used animals in ancient warfare. Horses, elephants, cats, dogs, monkeys and even Rhinos were used in the battlefields. As well as beeing turned into weapons, they have been used transportation for personnel and equipment, as well as troop morale-boosters in the role of mascots. But who would believe that even pigs were used as a war weapon in ancient times? Appearing about 240 BC, pigs were an interesting weapon thought to have been utilized in ancient Roman warfare. War pigs are pigs reported to have been used in ancient warfare, mostly as a countermeasure against war elephants. The property that made pigs useful as a tool of war was their ability to terrify elephants. The concept was to cover the pig in tar and a flammable substance and, when lured close enough to the advancing or defending enemy the pigs would then be lit on fire. According to Pliny the Elder, “elephants are scared by the smallest squeal of the hog,” a fact backed up Aelian, who confirms that in 275 BC the Romans exploited squealing pigs as a counter-measure against the war elephants of Pyrrhus. The hope was that pigs would run uncontrollably into the ranks of the opposing force, causing a certain level of confusion. Incendiary pigs or flaming pigs were not used as a military weapon only by the Romans. Historical accounts of incendiary pigs were recorded by the military writer Polyaenus and by Aelian. 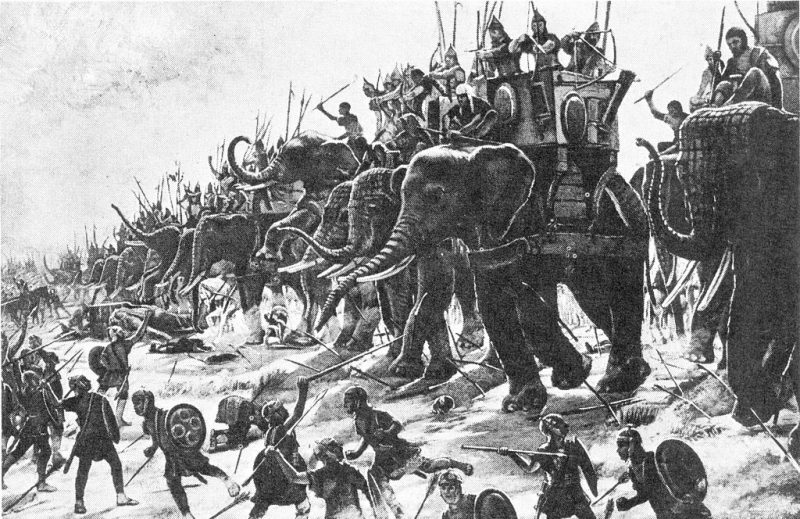 Both writers reported that Antigonus II Gonatas siege of Megara in 266 BC was broken when the Megarians doused some pigs with a combustible pitch, crude oil or resin, set them alight, and drove them towards the enemy’s massed war elephants. The elephants bolted in terror from the flaming, squealing pigs, often killing great numbers of their own soldiers by trampling them to death. The elephants, though highly trained, would not obey orders. They were frightened by the squealing pigs. Later on, elephant trainers kept their young elephants with baby pigs so future generations would be unafraid of them, thus robbing their opponents of their battle tactics.